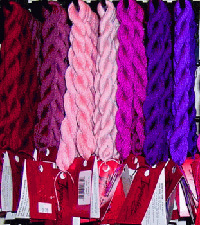 The Caron Collection offers us threads with a fantastic array of colors, textures, and varying thickness. Rachel, Rachelette, Impressions, Waterlilies, Watercolours, Wildflowers, Soie Cristale, Candlelight, Antica, Snow, and Kit Kin are just a few of Caron's versatile line. All threads in this section are registered and trademarked names of The Caron Collection.